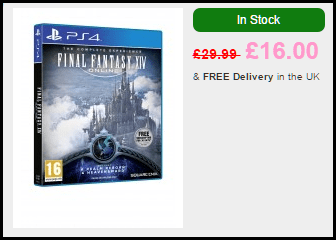 A good deal for those looking to get in on some Final Fantasy Online action. Use code SMART5 at checkout to take another 5% of the already great price. The Complete Experience includes both A Realm Reborn and Heavensward. Note that this is an online multi player only game. For newcomers to FINAL FANTASY XIV Online, this bundle is the most complete edition and includes both the award-winning FINAL FANTSAY XIV: A Realm Reborn and FINAL FANTASY XIV: Heavensward. Join over 4 million adventurers worldwide!